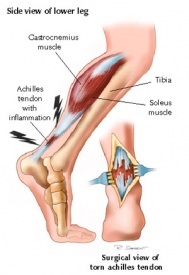 The achilles tendon is the strong fibrous band that attaches the calf muscles to the calcaneus bone. A rupture of the achilles tendon (ATR) is a common pathology and it is the most commonly ruptured tendon in the human body. The main causes of a rupture can be overstretching of the heel during recreational sports, a forceful plantar flexion of the heel or a fall from an important height. . 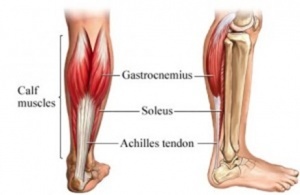 The achilles tendon is the longest and strongest tendon in the whole human body and consists of strong, inelastic fibrous connective tissue. It is the insertion of the soleus and gastrocnemius muscles and connects these muscles to the calcaneal tuberosity. These calf muscles are the main plantar flexors of the ankle. The incidence is 7 per 100 000 per year but goes up to 15 to 25 per 100 000 per year for (recreational) athletes, with a peak incidence at the age of 30 to 50 years. ‘ It affects mostly 'middle-aged weekend warriors' but this aetiology accounts for only about 70% of such injuries. An achilles tendon rupture occurs more frequently among men than women. The inherent characteristics, function, and blood supply of the Achilles tendon predispose it to both acute and chronic rupture. In the situation of an acute rupture, patients are usually engaged in athletic activities, accounting for 68 % of injuries. It is common in stop-and-go sports such as badminton, soccer, volleyball, basketball, tennis, racquetball, squash as eccentric movement puts an enormous amount of stress on the tendon. Violent dorsiflexion of a plantar-flexed foot when one falls from a height. At the moment of rupture a sharp pain will be felt, as if the patient was stabbed in the heel with a dagger. Often the rupture will coincide with a loud crack or pop sound. When palpating the tendon, a gap may be felt. The back of the heel will be swollen. Decreased active plantar flexion of the ankle. A positive outcome of the calf muscle squeeze test or Thompson Test. Some patients will have a history of tendinopathy in the heel or a prior cortisone injection. In most of the available literature, an achilles tendon rupture is described as chronic if it occurs at least 4 to 6 weeks after injury. The symptoms of chronic achilles tendon rupture include pain, decreased strength, fatigue, and ankle stiffness. A correct distinction needs to be made, because the treatments differ. The outcome measures used to evaluate functional results following an ATR can be broadly divided into two types: objective measures and patient-reported measures. The former are parameters directly registered by the physiotherapist, such as ankle range of motion (ROM) or calf muscle strength measurements. These objective data, derived from the patient’s physical examination, have traditionally formed the basis of functional assessment following an ATR. However, over the past two decades, it has become increasingly recognized that the patient’s own appraisal of outcome is of the most important when judging the results of a treatment. The best choice of outcome tools for reporting the results of treatment in patients with foot and ankle disorders remains uncertain and controversial. Nevertheless, on the basis of the available evidence, a patient treated for an ATR should be assessed with a disease-specific measure, such as the ATRS in combination with a generic measure, such as the SF-36 . The 36-item Short Form (SF-36) is a commonly used instrument for measuring the Health Related Quality of Life, it is a valid and reliable tool. The SF-36 has been proven useful in monitoring population health, estimating the burdens of different diseases, monitoring outcome in clinical practice, and evaluating medical treatment effects. . These patient-reported outcome scales focus on the patient’s perception of his/her health status, which has to be considered as the most important indicator of the success of a treatment. Patient-reported outcome scales should be complemented by objective indicators of function, such as muscle strength , calf muscle endurance  and return to previous activity level, in order to obtain a complete picture of the effect of the treatment. Standing - to look for fallen arches (flat feet) and other postural complications. Laying - usually on the front. This can be used to observe the tendon more closely for thickening, redness, swelling and nodules. Walking and running - to look for overpronation. Swelling: a swollen ankle can point to a rupture of the achilles tendon. On palpation: The achilles tendon is easily palpable. When palpating along the entire length of the tendon, a gap may be present. In this part of the examination the therapist asks the patient to fulfil some active movements which can aid in the diagnosis of a tendon rupture. Observing the gait pattern can be an important indication for a possible rupture. A patient with an ATR can possibly not make a plantar flexion of his ankle. So if the plantar flexion movement in the walking phase is hindered and painful, it can be an indication of an achilles rupture. A patient with a achilles rupture will show an overpronation of the injured ankle. The patient will also show a lack of push-off at the end of the stance phase as a result of the dysfunction of the Gastrocnemius and Soleus muscles. Instructing the patient to stand on his/her toes for making a plantar flexion. This will be impossible if the patient has an ATR. Ask the patient to actively plantar flex the ankle. Every active movement containing a plantar flexion of the heel will be almost, if totally not impossible. Thompson Test - this test is especially useful for diagnosing complete achilles tendon ruptures and less useful for the diagnosis of partial ATR. There is still considerable controversy as the most optimal treatment plan. Debate about nonoperative vs surgical repair for acute ruptures, minimally invasive vs traditional open repair, and early functional rehabilitation protocols instead of a more traditional rehabilitation program are only a few of the arguments that continue to exist in the realm of treatment. Historically, intervention has been dependent on personal factors such as age, desire to return to sport and individual preference. Operative repair by sewing the torn ends of the injured achilles tendon together was considered to reduce risk of a future re-rupture but wound infection presented a possible complication such as scar adhesions, loss of sensation, DVT, and infection. Therefore younger persons were recommended to choose for the operative repair and elderly and less active patients were recommended for a conservative approach with immobilisation in cast. Post surgically, early weight bearing and early ankle mobilisation is now widely accepted. However more recently, it has been demonstrated that a conservative and accelerated functional rehabilitation approach is more effective than a surgical approach. Wu et al showed that when functional rehabilitation was used, the effect of non-surgical intervention was similar to surgical treatment regarding the incidence of range of motion, a future chance of re-rupture, calf circumference and functional outcomes and also the incidence of other complications was reduced. Willits et al found all measured outcomes of nonoperative treatment with a functional rehabilitation protocol were acceptable and were clinically similar to those for operative treatment, in addition, this study suggests that the application of an accelerated-rehabilitation nonoperative protocol avoids serious complications related to surgical management. Non-surgical intervention significantly increased the re-rupture rate if a functional rehabilitation approach is not available. There are a variety of approaches to the surgical management of this injury and contention exists over the surgical approach (open or percutaneous). There is a difference between surgery for chronic and acute ATR. 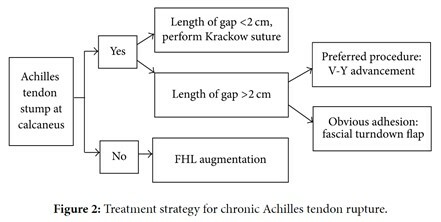 By evaluating the presence or absence of achilles tendon stumps and the gap length of the rupture, different surgical options (V-Y advancement, gastrocnemius fascial turndown flap, or flexor hallucis longus tendon transfer) can be selected for tendon repair. Due to a high complication rate after open surgical repair, including wound infection, abnormal sensation, adhesion and thrombosis new technics which require much smaller incisions have been developed. Minimal invasive technics and percutaneous repair become more and more common because they reduce complications and have both a good outcome. The aim of non-operative means of treatment is to restore and maintain contact between the two ends of the ruptured Achilles tendon to facilitate healing. Conservative treatment regimens vary greatly but commonly involve immobilisation with rigid casting or functional bracing. Gulati et al describe the conservative approach to be this, "the foot is initially placed in full equinus (30° namely full plantarflexion). The foot is then brought into neutral sequentially over a period of 8-12 wk. Once ankle position permits it, weight bearing is allowed. There is currently no clinical consensus on whether the cast should extend above the knee or if a below knee cast is sufficient". Rehabilitation depends on the initial management approach taken - surgical or non-surgical. However, the patient will normally wear a plaster cast for immobilisation or a below-knee dorsal brace which allows the ankle to make a plantar flexion to start early mobilisation. After the cast or brace is removed rehabilitation is mainly focused on firstly improving the range of movement of the ankle, later it is focussed on increasing the muscle strength and muscle coordination. A return to activities should be expected at 4-6 months of therapy, but the rate of rehabilitation greatly depends on the quality of the treatment and the motivation of the patient. Gait training exercises can be started, followed by activity specific movements. The patient can start with theraband exercises by starting from the lowest resistance and work up from there for regaining strength. The patient should also continue with the previous exercises. The patient is able to run approximately 14 weeks after the injury or surgery. Running on even ground is allowed when the patient can perform 5 single-legged heel-rises with approximately 90% of the height of the uninjured leg. Jogging upwards on stairs is allowed if the patient can walk 5 meters on their toes without the heel falling down. Patient takes places on a step, standing with full bodyweight on the forefoot of both feet, the knees are extended. Then he is asked to go stand on his/her toes and to raise the non-injured leg so that his/her bodyweight is on his injured leg. Now the patient slowly lowers the heel. In this way the calf muscle eccentrically guides the motion and is eccentrically trained. When the patient can perform this exercise without discomfort, he/she can increase the load by adding books or other weight to a backpack, or to perform the exercise with a flexed knee. After completing the rehabilitation program, new examination of the tendon healing and functions is required. If needed, a new referral for further physiotherapy sessions can be provided to the patient. Gradual return to sports is recommended. For example before participating to contact sports, the patient should wait at least 6–9 months after the injury(Level of evidence: 2)(Level of evidence: 1b).